Aventuras del Sur began from a familiar dream that was forged slowly with patience and love, by the hands of an Andalusian little family and other persons who helped us to make our dream come true. The grand variety of the flora and fauna of this region, the abundance of incredible hiking paths and horse tracks, the strategic site of our finca and a large list of wonders let this small seed grow to what our dream is now: Aventuras del Sur. A project that we are very proud of and we would like to share with YOU. The Nature, the horses, the Paco´s knowledge about horse life, (as founder of this project, together with Victoria), and the passion about Yoga and Meditation of other members of the team, has brought us here, giving birth to this beautiful project that we would like to share with the world and offer this activities in this beautiful Natural Park: horse riding, hike and Yoga. 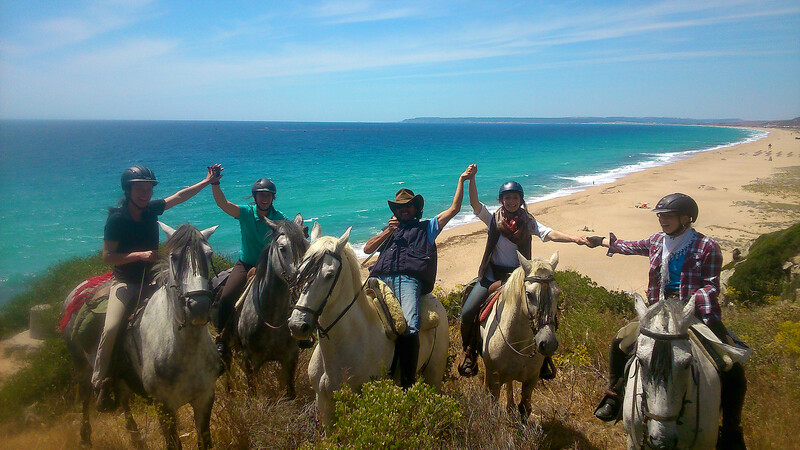 We invite you to visit us at the Costa de la Luz (Coast Of Light) near Tarifa where you can enjoy horseback riding or practising yoga, or take yourself on exciting walks along virgin beaches or mountains, merged in silence and pure nature. We offer you the possibilities of just saying hello for a single horseback riding trip or staying with us the whole week, half-board catered, full of activities and discoveries. Take a break from the busy hustle of daily life and join us at Aventuras del Sur, Equestrian & Yoga Center in Andalusia, Spain. This will be a small, intimate retreat so you can have the full attention of the team. Spend the entire week focused on what you love and allow this immersive experience to transform your riding as you relax, reflect, and rejuvenate your body in a paradise with delicious food and daily yoga – not to mention meeting some amazing people and horses! Little groups, very personal and with familiar ambience. - Free animals around the hole Park! - 3 to 4 horse riding in amazing horses and friends with unforgettable landscapes. - Incredible hikes to the mountain or beach from the house. 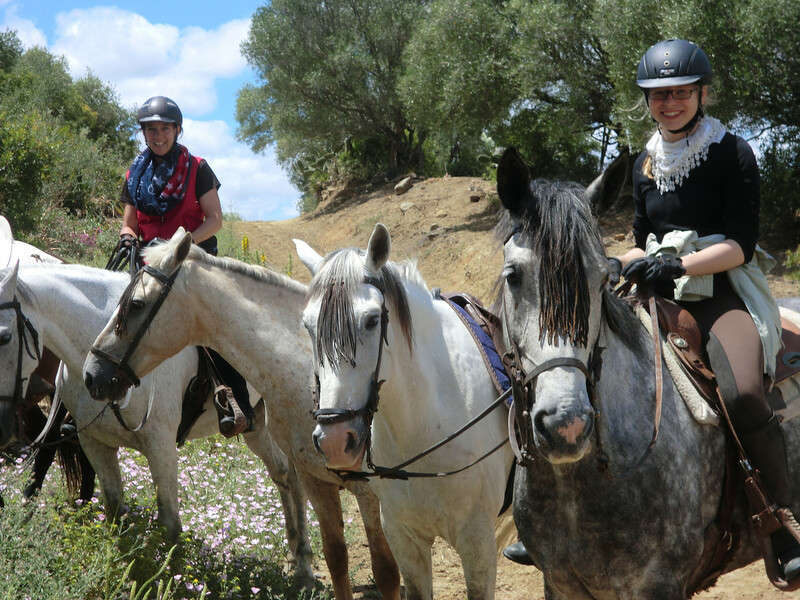 Imagine an entire week to devote to your riding with daily lessons, trail rides through pine tree and eucalyptus forests, along natural paths and across beaches. 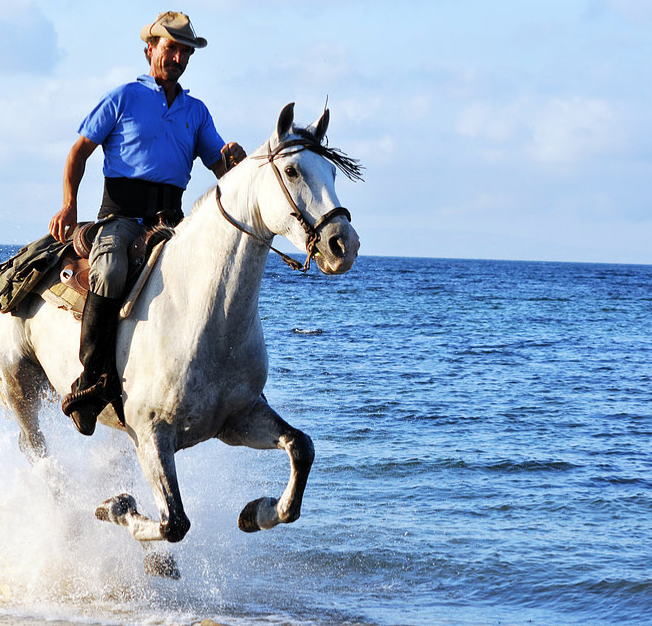 Through this whole experience Paco will be your horse-guide, taking your riding to a new level. Most of Paco horses were born here, some of them came from other places, but they adapted and are now living free with the rest of the horses in the Natural Park. Because of this way of life (which should be the normal life but now a days is special because the world changed..) - living free - the horses are happy, calm and living in harmony which helps the rider to be confident very quickly! We will ride along sand beach dunes, pine tree and eucalyptus forests, enjoying Africa- and ocean views and will be galloping along the shore…. Paco will help you during the tour if you need assistency. You can choose 1 hour horse riding tours (for beginners), 2 hours horse riding tours or 3-4 hours for advanced or experienced riders. (Know more at the booking page). *If you are interested in a week of horse riding holiday or even horse back riding and Yoga, write us a message or book online in bookings. *If you are only interested in a 1 or 2 hours horse riding tour, you can book directly with the guide (Paco) via whats app: (0034) 678 626 703.
spend a great week practising Yoga with us! During the week our mental peace and equilibrium will increase, we will learn to live more in the Present Moment. Our Yoga session is dynamic and flexible, calming and heating. We practice Ahimsa (non-violence) with regard to body, speech and mind. For your yoga practice that means with regard to your own body. All of this will make you start the day more conscious, more awake, stretching the whole body and heat the body before the horse ride, the perfect combination! The meditation will bring more mental peace which will make make you feel more happinest in our self! The concentration, the breathing and calming the mind, free of thinkings is difficult, but practicing it in a group will create a special atmosphere and help you on the way to it. The Yoga season is 1,30h aprox, if you want to know more about it, please see OUR TEAM / Yoga instructor. ACCOMMODATION IN OUR PACKAGES OF 1 WEEK ACTIVITIES VACATIONS. The lodgement in our retreats and holidays are in our cozy country house with family ambience. We are always happy to help you and spend energy to make you enjoy and have an unforgetable great week! The rooms have a special touch with African views terraces and a particular decoration. 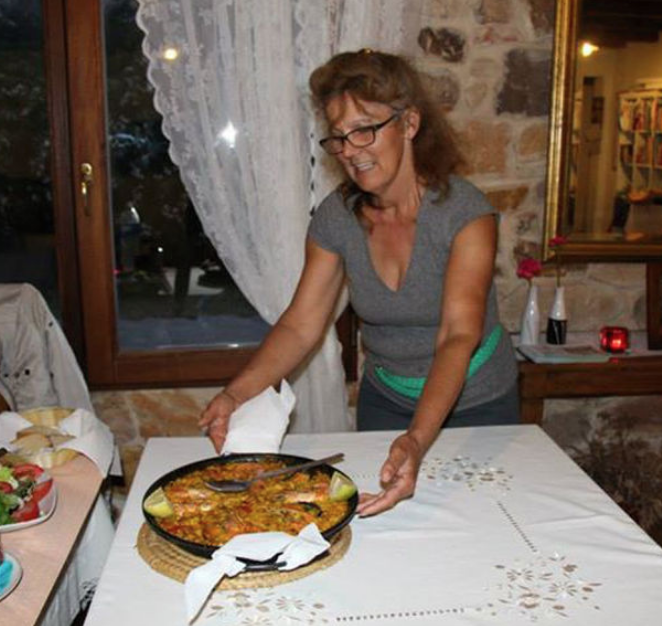 The kitchen is traditional Mediterranean, we cook with love and care. The dinner room is a warm hall where we serve the breakfast and dinner. There is a fire place for winter time, nice to share stories with the group. The decoration is traditional and built with traditional materials, wood and stones… and is also to share with the family. (We love it). The Yoga hall is comfortable, with nice views and the material for Yoga. We also have bikes that you can use. We have a outdoor horse track too, for ecuestrian classes and for horse training. *We also have stables in case someone want to bring his horse. Finally the vegetable garden, we get normally most of our eco veggies from!! We are in Andalusia, in the province of Cádiz. Tarifa is the nearest town only 15 minutes driving from here. The nearest beach is only 5 minutes. Aventuras del Sur is located in a very small and special village called Betis, between mountains and the sea, conserving still the privacy from the Tarifa tourist spots in Summer and surrounded by the best nature, pure and fresh. The nearest Airport is Gibraltar, less than 1 hour driving, there are cheap flights from England. The more comfortable and little Airport is Jerez, 1,15h. from here, (you can find good prices in some flight companies like Tui). Just in front of the airport you can rent the car. The biggest Airport and with most flights is Málaga, 2 hours driving from here, (getting the payment road). Sevilla is another option and come by bus or car. (2,30 – 3h. far). Other possibility is come by ship from Tanger, Marroc, only 30 minutes from Tarifa, so in case you want to visit Maroc you can cross by boat and I will pick up you in Tarifa. *You can find us in Google map to come direct. Round trip: 100€ Gibraltar. 120€ Jerez. 150€ Málaga, minimum 2 persons per transfer. Other option is the bus to Tarifa where we pick you up for free. (“Alsa” or “Comes” companies). *we are also happy to connect the people for share a renting car if you are interested! THINGS TO DO IN YOUR FREE TIME!! We recommend you to come by car if you want discover more of Andalusia, but it´s your decision, maybe you like the nature and silence and don´t need to go far!! southern extreme of Europe facing Africa where the Mediterranean and Atlanthic ocean meet. discover small untouched beaches with white sand and a blue ocean. From the house you have a beautiful view on the African coast, the Atlantic, and the countryside. home. Besides our family, friends and volunteers contribute to the realization of our family dream. hikes, the beaches and much more.